An (2015) ☆☆1/2(2.5/4) : Would you like her pancake? 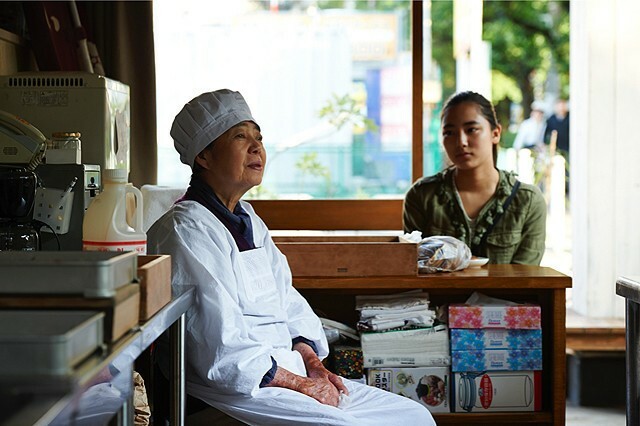 Japanese film “An”, which is also known as “Sweat Red Bean Paste”, is a lightweight drama about life, nature, and, yes, those sweet pancakes called dorayaki. 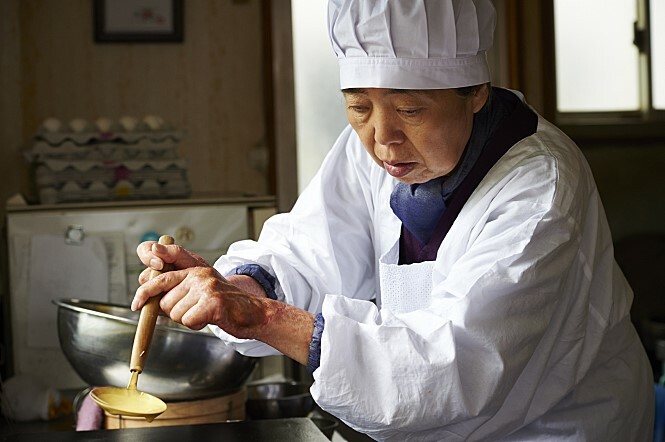 While it is nice to get some glimpses of how this simple Japanese confection is made, the movie merely meanders along with its flat, superficial characters, and its gentle, meditative mood does not entirely compensate for its weak plot mixed with rote life lessons. For Sentaro (Masatoshi Nagase), making and selling dorayakis alone at a small shop located in some urban area is more like a draining predicament rather than a labor of love. This sullen reticent guy does his job only because he owes lots of money to the shop’s owner due to some incident in his past, and he is not particularly interested in serving good dorayakis to his customers as going through his lonely daily life. When one of the customers happens to find something which is not supposed to be inside a dorayaki, he simply gives her another one for free, and that is all. On one spring day full of cherry blossoms, someone suddenly enters his life. Not long after he put a notice for hiring an employee, an old lady named Tokue (Kirin Kiki) comes to the shop, and this rather odd but sunny lady says she would like to work for him despite her old age. Although she says she has a considerable experience in making confections, Sentaro rejects her because he thinks she is too aged to work with him. She comes again on the next day, and she gives him a sample of her sweet red bean paste for dorayaki, which, of course, impresses Sentaro for its sublime sweetness when he tastes it later. On their first day at the shop, she shows him how she makes sweet red bean paste in her own simple but caring way. After fresh red beans are soaked in clean water in advance, they go through repeated procedures of washing and boiling for several hours. They add lots of sugar and molasses to sweeten up the cooked red beans, and then their sweet red bean paste is finally prepared while Sentaro is ready for making those small, round pancakes. All they have to do now is sandwiching the paste between pancakes and then selling their final products to customers. Thanks to her sweet red bean paste, more customers come to drop by the shop than before, but then, as you have already guessed, there comes a problem when the shop’s owner happens to learn about something Tokue did not tell to Sentaro, who does not go too deep into her past because he likes her and he begins to enjoy his work thanks to her enthusiasm. He does not care much about Tokue’s secret even when it is directly told to him by the shop’s owner at one point, but he knows well that he has no choice but to let Tokue go sooner or later. He becomes bitter and frustrated as before, and Tokue also comes to sense how she becomes a burden to her young employer. Based on the novel written by Durian Sukegawa, the movie makes some points about the unfair discrimination of a certain type of social outcasts like Tokue. During its second half, it looks around a small isolated rural community where she has lived for many years, and she and other community members remind us of how people harshly distance themselves from others just because of fear and ignorance. As she did in her previous works such as “The Mourning Forest” (2007), the director/screenplay writer Naomi Kawase takes a somber, restrained approach to the story as occasionally focusing on soothing sights and sounds from nature backgrounds. A narrow forest road to Tokue’s community feels like a portal to other world with its relaxing green ambiance, and we come to listen closer to the sound of wind and rustling tree leaves as Tokue tells more about her humble life philosophy and herself. While it thankfully sidesteps the inherent sappiness of its drama, the movie instead falters with deficient characterization and trudging narrative pace. While Tokue is more or less than your average old noble lady to dole out her wisdom of life to others from time to time, Sentaro is not a very interesting character to hold our attention either, though Masatoshi Nagase did a good job of conveying to the audiences the subdued melancholy inside his passive neutral character. In case of Wakada (Kyara Uchida, who is Kirin Kiki’s granddaughter), a teenager girl who has been close to Sentaro as one of his usual customers, we do not get to know enough about her except the vague depiction of her unhappy domestic life. When Wakada reveals something supposedly important to Sentaro, it does not help the story much because 1) the fact in question comes out of nowhere without any foreshadowing and 2) we do not have any clear idea of her relationship with Tokue – or Sentaro. “An” is a sincere and likable film made with some goodwill, but I did not like it enough for recommendation. I felt distant to the story constantly while not caring a lot about the making of dorayakis or sweet red bean paste, but I want to tell you how graceful Kirin Kiki is as the best thing in the film. This 72-year-old Japanese veteran actress has drawn my attention for her notable supporting roles in Hirokazu Koreeda’s recent films including “Still Walking” (2008) (she was fabulous as the matriarch character in that haunting family drama film), and I admire how she brings a sense of life and experience to many clichéd moments in the film. She is indeed aged to play such a role like that, but I am still not sure about whether the movie is good enough for her earnest efforts. This entry was posted in Movies and tagged Cooking. Bookmark the permalink.